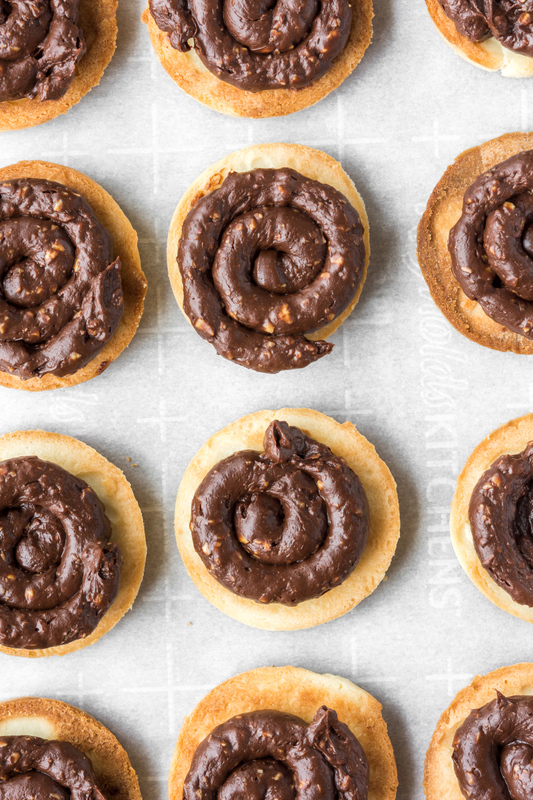 These cookie sandwiche are all about the hazelnut ganache. It tastes like the filling of a Ferrero Rocher truffle with the rich dark chocolate, a touch of fruity cognac and the soft, nutty crunch of finely chopped hazelnuts. I piped the ganache in between two butter cookies for a sandwich that tastes like a Milano on steroids. 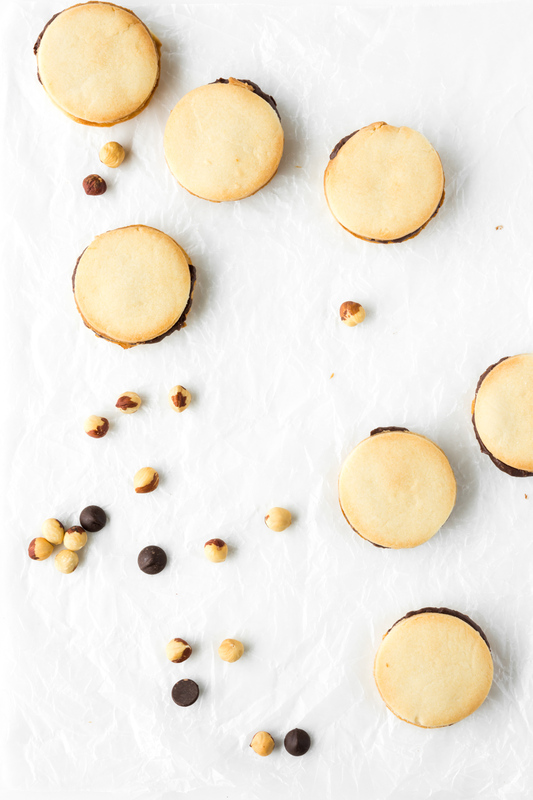 The sandy, crumbly cookie, thick layer of dense ganache and tender pieces of hazelnuts are everything I’ve ever wanted in a cookie sandwich. These make wonderful gifts because the ganache errs on the firm side, so you don’t have to worry about the sandwiches sliding apart and the chocolate seeping out (unless it’s really hot out, in which case you should keep them as cool as possible and/or eat them all). They’re also really flexible to make. The cookie dough can be made a few days ahead of time, or it can be rolled out and frozen until needed. The cookies can even be baked a day early, stored in an airtight container, and then filled with the chocolate. The ganache can also be made ahead and slowly reheated in the microwave (10 second intervals, stirring in between), though I prefer to make it on demand since it’s pretty quick. While these are a great cookie for the holidays because they’re not too sweet or finicky to make (and they stack so you can load up paper plates with no problem! ), they’re also a great cookie for any time of year. I keep envisioning these cutout into little heart shapes for Valentine’s day or a birthday. Keep these cookies in your back pocket— you'll come to them again and again. Enjoy! Combine the sugar, butter, egg yolk, salt, and vanilla, beating until smooth. Add the flour, mixing until smooth. The mixture will seem dry at first, but will suddenly come together. If it doesn't, dribble in 1 tbsp of water to prevent it from being too crumbly and dry. Sprinkle your rolling surface with flour, and flour your rolling pin. Working with one piece of dough at a time, roll it 1/8" to 3/16" thick. Use a cookie cutter (or glass) to cut into circles. Re-roll and cut the dough scraps. Place the cookies on parchment-lined baking sheets. They can be close together; they'll barely spread. If the cookies are really soft at this point, pop the baking sheets in the freezer for 5- 10 minutes to firm up. Bake the cookies in a preheated 350°F oven for 12 to 14 minutes, until they're set and barely browned around the edges. This can happen very quickly, so watch them closely after about 10 minutes. Remove the cookies from the oven, and transfer to rack to cool completely. While cookies are baking and cooling, make the ganache. Toast the hazelnuts on a baking sheet, stirring frequently, until lightly browned and fragrant, about 5 minutes. Transfer to a clean dish towel, wrap tightly and let steam for 5 minutes. Rub the nuts vigorously with a towel to remove the skins then set aside to cool completely. Transfer nuts to the bowl of a food processor fitted with a metal blade and chop until finely ground (but not a paste), about 30 seconds. Set aside. 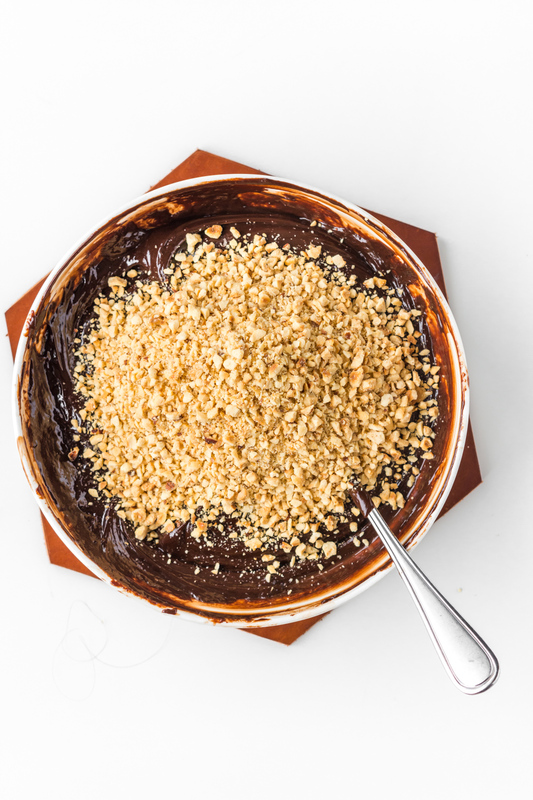 Place chopped chocolate in a medium bowl and set aside. In a small saucepan, heat heavy cream over medium heat until small bubbles form at the edges. Pour cream over chocolate and let stand one minute for the chocolate to melt, then stir until mixture is smooth. If the chocolate doesn't fully melt, microwave cream and chocolate mixture at 10-second intervals, stirring in between, until melted and smooth. Stir in alcohol (or vanilla, if using instead) and ground hazelnuts. Cover and refrigerate until thickened but not hard (the consistency of peanut butter), about 25 minutes. Stir the ganache then transfer to a pastry bag fitted with a large, round, plain tip and pipe ganache to cover the surface of the cookie leaving a slight border around the edge. Alternatively, spoon about 1 tbsp of ganache onto the cookie. Top with a plain cookie to make a sandwich, and gently press down to adhere the top cookie and squish the ganache to the edge of the sandwich. Repeat process with remaining cookies. Store up to one week in a covered container. if the ganache gets too hard to pipe, soften it up in the microwave with 8-10 second intervals, stirring in between. It warms up quickly, so err on the side of less time in the microwave!